This article originally appeared on Culture Brats on October 26th, 2010. But we're bringing it back (along with a few others) to get you ready for Halloween! Because several of us are eagerly anticipating Sunday's premiere of AMC's The Walking Dead, we thought it would be cool to conclude our month-long look at horror movies with our favorite zombie flicks. Enjoy! Once I got into zombie movies, there was no stopping me. 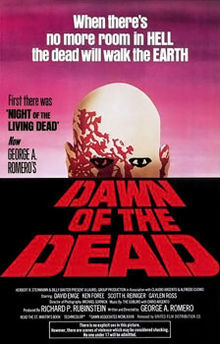 I've seen a lot of good ones (and, let's be honest, even more bad ones), but the original Dawn Of The Dead will always be my go-to zombie flick. It was the first one I ever saw. A friend of mine who, at the time, was much more into gory movies than I was, tried again and again to get me to watch it. He kept trying to convince me that it was funny and had a good story in addition to being a celebration of the eating of flesh and the exploding of heads. I eventually gave in, and was more than pleasantly surprised. Not only was it everything he said it was, it was also a rather fascinating study of human nature and behavior. Yeah, it's great zombie fun... but for what it is it's pretty damned deep! I'm a sucker for post-apocalyptic films. Throw in some zombies and, well, I'm in. All in. Now, we can quibble with the definition of "zombie." I know we have in putting together this list. 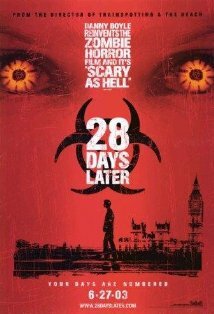 Are the zombies we have here in 28 Days Later wreaking havoc in England the George Romero "gots to find me some brains" zombies we've come to know and love? No. But do we have single-purpose, mindless killing machines hell-bent on infecting everyone? Oh, hell yeah. Additionally, Danny Boyle and Alex Garland gave us something that we hadn't yet seen: zombies with some get-up-and-go. For the most part, the undead have been lumbering, shuffling corpses attacking in hordes. Not so here. Here we have sprinting zombies, which, I believe breathed new life into the genre and can be found in the newer Dawn Of The Dead and in Zombieland. For the record, I don't watch horror films for moral lessons or political commentary. Life is full of those already. I do, however, like The Twilight Zonesque "what if we're the last people on Earth" theme that's present in 28 Days Later. The juxtaposition of the rage-infected zombies and the "repopulate the world" single-mindedness of the major and his troops offer a nice study in parallelism. The latter pushes the viewer to ask whether or not the soldiers are really any different from the zombies from a purely visceral standpoint. Bah, who cares? There's a lot of good killing and blood and gore. There is a really good reason Zombieland is the top-grossing zombie film to date, it has pretty much everything: humor, gross undead, Bill Murray, Kill of the Week, lots of guns, some touching human moments, and a definite, subtle creepiness. Let's get all thinky for a moment: the thing about zombies is that they are not only symbolically the faceless masses, they often don't have faces at all. Yuk yuk! 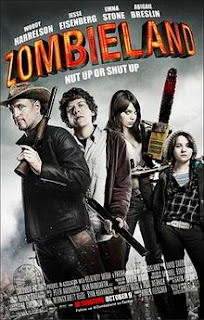 Zombieland was smart enough to take the facelessness a step farther by removing its characters' real names and replacing them with locations. This places an extra isolating dimension to the usual zombie apocalypse landscape. Tallahassee, Columbus, Wichita, and Little Rock are at times larger than life (especially Tallahassee - go Woody! ), but they're also dehumanized, stripped of all that they were. I wouldn't say Zombieland is any scarier than some jump out of your seat moments, but the barrenness of the characters' future existence eats at you. Then as the movie goes on, it adds the humanity back into each character. Little Rock's lost childhood and Wichita's concern for her. Tallahassee finally talking about his son. Columbus being shaken out of his shell shock. Unlike with the usual gore-fest film, your concern for them grows just as the final zombie confrontation builds. Until each of them discovers that they could be a new family, they didn't have to wander through the future alone... all found amid some mind-blowing zombie massacring! Because the real fear of zombies isn't that mutated disease will eat away at your face (because at that point you won't care), it's that you'll be left alone. You're walking through an open meadow ringed with woods. There's no reason to be concerned. It's not even dark out yet. You're in an open space where nothing can jump out at you. Then you realize that, in the distance, a figure is walking towards you. Or maybe he's sort of lumbering. You don't even realize it's not human until it gets closer. Then there's another one, lurching towards you from another direction. Then two more. They finally get close enough for you to see what they are. And then you realize that you're surrounded. They finally get close enough for you to realize what they are; by then, you're in the middle of a relentless, slowly tightening noose of walking corpses. That's the recurring nightmare I had after I first saw George Romero's 1968 original Night Of The Living Dead. Some people don't see what the big deal is: it's not bloody. It's not that violent by today's standards. It's filmed in grainy black and white. The acting is wooden. At one point, you can see a crew member's hands moving a prop into a shot. Still, it's one of the scariest movies I've ever seen in my life. It's the granddaddy of all zombies flicks: a simple story about innocent people trapped in an abandoned farmhouse, surrounded by a growing mob of bloodthirsty zombies who may move slowly, but are still very, very goal-oriented. 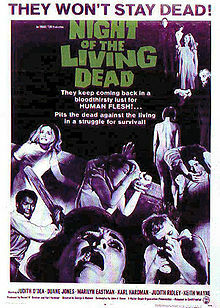 It's easy to make fun of in the beginning: the over-the-top acting, the slow shamble-walk of the zombies. But at some point, the movie stops being fun-scary. It becomes frighteningly clear that none of those people in the farmhouse are going to make it. Some are carried off by monsters. Others turn into monsters themselves. A mother is killed by her own daughter. A woman is devoured alive by a mob. And the final death scene is in many ways the most frightening, because it doesn't actually involve zombies at all. This isn't a horror movie. It's a stark portrait of the beginning of the end of the world. You will fight, and then you will run. You will find the best hiding place. You will squeeze yourself into the smallest corner possible and screw your eyes shut tight. You will silence your own breathing until you're not making the faintest sound that might betray you. You will do everything right. We showed you ours, now show us yours! 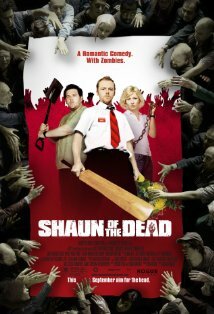 What's your favorite zombie movie?